Mayfield has convenient locations throughout Greater Cincinnati and Northern Kentucky. And because we are an independent physician practice, we care for patients in all of the region’s premier hospitals. Rest assured — they all have "Mayfield Inside." Follow I-71 south to Exit 6, Smith/Edwards Road. From right lane, turn left on Williams Avenue. At next light, turn right on Edwards. At next light, turn right into the Rookwood Exchange complex. To access the parking garage, proceed to Stop sign (Bravo's on right) and turn right; the garage is on the right. Route 562 East/Norwood Lateral. Follow 562 East/Norwood Lateral to I-71 South. Continue to Exit 6, Smith/Edwards Road. From right lane, turn left on Williams Avenue. At next light, turn right on Edwards. At next light, turn right into the Rookwood Exchange complex. To access the parking garage, proceed to Stop sign (Bravo's on right) and turn right; the garage is on the right. Follow I-71 North to Exit 6, Smith/Edwards Road. Turn right at end of exit ramp on Edmondson. At next light, turn left into the Rookwood Exchange complex. To access the parking garage, turn left just before Bravo's; the garage is on the right. Reserved patient parking is located on LEVEL A in parking garage behind building. BUILDING ENTRANCE - Enter through the glass doorway. Pass the garage elevators. Once inside, take the building elevators to third floor. Take I-75 South to I-275 West. Continue to I-74 East, Exit 28. Follow I-74 East to Exit 11, Harrison Pike/Rybolt Road. Turn left on Old Rybolt Road. Turn right on Harrison Avenue. Continue approximately 1.2 miles. Mayfield's office is on the left. Take I-74 West to exit 11 (Harrison Pike/Rybolt Road). Turn left on Harrison Avenue. Continue approximately 1.4 miles. Mayfield's office is on the left. Take I-75 North to I-74 West. Take I-74 to Exit 11, Harrison Pike/Rybolt Road. Turn left on Harrison Avenue. Continue approximately 1.4 miles. Mayfield's office is on the left. Take I-74 East to Exit 11, Harrison Pike/Rybolt Road. Turn left on Old Rybolt Road. Turn right on Harrison Avenue. Continue approximately 1.2 miles. Mayfield's office is on the left. 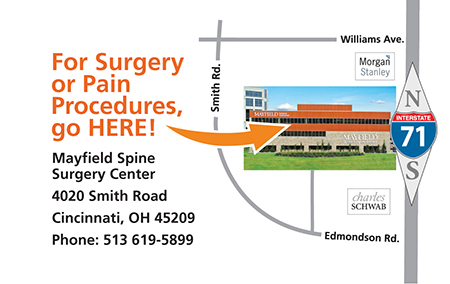 Mayfield Spine Surgery Center is conveniently located off I-71 in the Cornerstone at Norwood development. Follow I-71 south to Exit 6, Smith/Edwards Road. Turn right at the end of the ramp onto Williams Avenue. Take a left at the next intersection onto Smith/Edmondson Road. Turn left at next light into the Cornerstone complex. Take I-74 east to I-75 north. Follow Route 562 East/Norwood Lateral to I-71 South to Exit 6, Smith/Edwards Road. Turn right at the end of the ramp onto Williams Avenue. Take a left at the next intersection onto Smith/Edmondson Road. Turn left at next light into the Cornerstone complex. Follow I-71 North to Exit 6, Smith/Edwards Road. Take a left at the end of the ramp onto Edmondson. Edmondson quickly becomes Smith Road. Turn right at next light into the Cornerstone complex. Follow I-71 south to downtown Cincinnati. Take I-471 south into Kentucky. Take I-275 west to exit 82, Turkeyfoot Road. Turn left on Turkeyfoot. At third light, turn left onto Thomas More Parkway. At next light, turn left on Centre View Boulevard. Building 12 is on the left (look for green building sign). Take I-75 south through downtown Cincinnati and into Kentucky. Follow I-75 to exit 185 for I-275 east. Follow I-275 east to exit 82, Turkeyfoot Road. Turn right on Turkeyfoot. At second light, turn left onto Thomas More Pkwy. At first light, turn left on Centre View Boulevard. Building 12 is on the left (look for green building sign). Take I-75 north to I-275 east to exit 82, Turkeyfoot Road. Turn right on Turkeyfoot. At the second light, turn left onto Thomas More Parkway. At first light, turn left on Centre View Boulevard. Building 12 is on the left (look for green building sign). Take I-275 west to exit 82, Turkeyfoot Road. Follow directions above from the north (I-71). Take I-275 east to exit 82, Turkeyfoot Road. Follow directions above from the south. Take I-75 South to Exit 19 for Union Centre Boulevard toward Fairfield. on Centre Pointe Drive. Continue to the first driveway on the left. the first driveway on the left. For your convenience, wheelchairs are available inside Mayfield's suite on the second floor. View Mayfield Clinic Office Locations in a larger map.